Last week in the Federal Register, the United States Small Business Administration increased 37 small business size standards for 34 industries in Sector 54, Professional, Technical, and Scientific Services. Under the North American Industry Classification System (NAICS), used by Canada, Mexico, and the United States, the industry code for Environmental Consulting Services (541620) was increased from $7 to $14 million. The majority of cultural resource consulting firms in North America are in the Environmental Consulting Services category. This change was effective yesterday, 12 March 2012. Within the United States, many, perhaps the majority, of cultural resource compliance service contracts issued by the federal government are set aside for small businesses. This new, larger, small business size category will change the competitive landscape by allowing firms with annual revenue up to $14 million to compete directly with truly small firms for small business contracts. 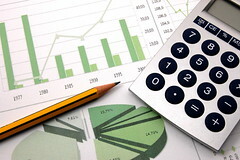 The American Cultural Resources Association (ACRA), the trade organization for the heritage compliance sector, classifies small firms as those with annual revenue below $400,000, medium firms as those with annual revenue between $400,000 and $1.5 million, and large firms as those having annual revenue above $1.5 million. This new ruling will not provide any protection for truly small heritage firms, those in ACRA’s small and medium categories, and create head-to-head market competition for all firms below the $14 million threshold. For companies who target the federal contracting sector, there is now an advantage to being larger and this may prompt a new round of heritage firm mergers and acquisitions in North America. Heritage-only firms may look for their top-level workers through other means than advertisement such as internal promotion or through professional networks. A lack of lower level positions in multi-service firms may make it hard for them to recruit internally. What these data do show is that the majority of job advertisements for archaeologists at all career levels was dominated by multi-service firms in 2011. Does this mean they get the majority of business? That can not be determined from these numbers but employment may indicate strong growth prospects. In a recent HBJ post (17 February 2012), Christopher Dore reported that it appears that heritage-only consulting firms are losing market share to full-service firms. To add a different set of numbers to his data, I took a look at the number of job postings for field technicians on the job websites Shovelbums and ArchaeologyFieldwork.com for 2011. Eliminating duplicate posts both between and within the websites, I looked at companies offering jobs for field technicians: a total of 330 separate posts. Jobs were considered separate if the project was different even if the company was the same, six or more months had passed, or it was an emergency hire for a previous job (assumed to be a separate hiring event). If single ads were for multiple positions, the number of positions offered was not counted as most job postings did not give those details. Surprisingly, not every job listing had the company’s details or even the firm’s name on it. Thus, of the 330 unique postings, 295 were used for analysis. 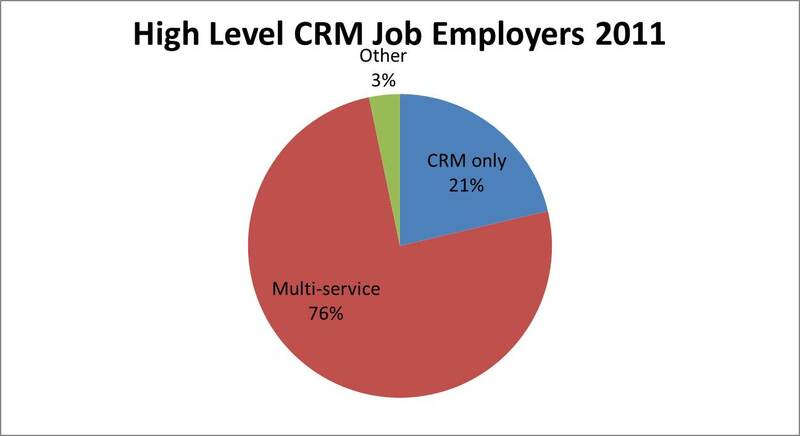 Here is the break down of job hiring events between CRM only firms, multi-service firms, and other firms. In 2011, multi-service firms posted more than twice the number of job ads for field technicians than did cultural-only firms. These employment data seem to support Dore’s observation that heritage-only firms are losing market share to multidisciplinary environmental and engineering companies. There are limits to what can and should be inferred by these results. 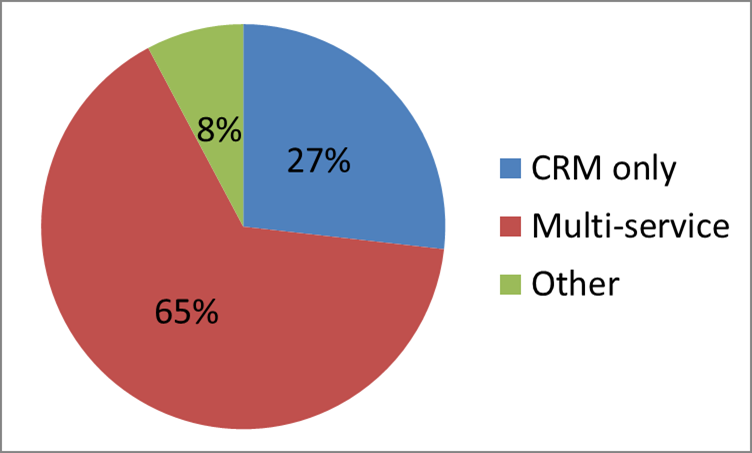 There are many small CRM firms that do not advertise for field technician positions as their projects are too small to require a full crew. Though it does say something that the majority of job adverts for lower level positions are being done by multi-service firms. The full data can be accessed here. A pattern of data suggests that heritage-only compliance consulting firms are losing market share to larger multidisciplinary firms in the United States. Historically, there has been some ebb and flow of market share between heritage-only firms and multidisciplinary environmental and engineering companies. Now, however, there appears to be a more substantial, unidirectional shift and this trend has been underway prior to the U.S. economic recession of 2008. 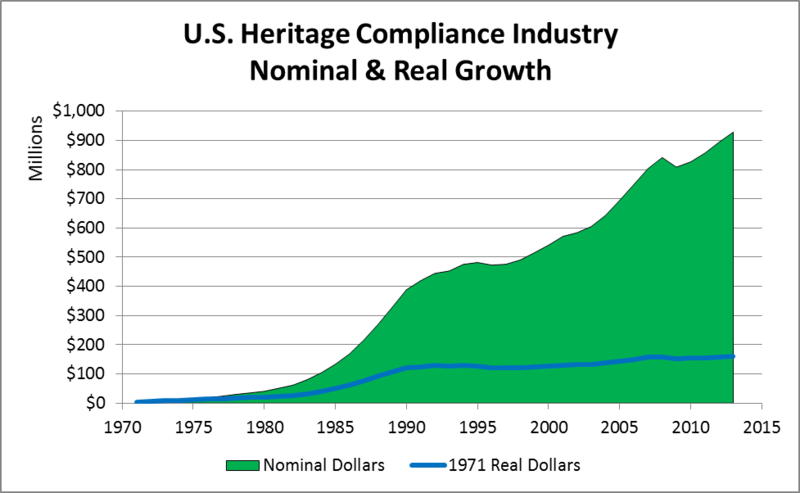 The annual heritage compliance market in the U.S. has been estimated by many over the last decade to be in the range of $0.8-1 billion. While data to base this market estimate are poor, the fact that many authors (most notably Altschul and Patterson in 2010) have converged upon a fairly narrow range provides some measure of confidence. According to data from Environmental Business Journal, the overall environmental consulting and engineering sector of which heritage compliance is a part was valued at $27.6 billion in 2011. This, then, means that heritage compliance is 3.6 percent of the total environmental consulting sector in the U.S. Since 1991, there have only been two years (1996 and 2009) when the sector did not have positive growth. Since 2009, growth has been 2.2 percent in 2010 and 3.7 percent in 2011. Five percent growth is expected in 2012. The American Cultural Resources Association (ACRA) has surveyed heritage firms periodically since the end of the recession. In March, 2010 44% those surveyed reported a decrease in business in the six months prior to the survey and 65% forecast that business would not grow in the six months following the survey. There was little change a year later when, in March 2011, 46% of firms reported a decrease in business over the previous six months and 61% forecast that business would not grow in the next six months. Yet, these surveys were done at a time when the industry grew by 5.9 percent, or about $53 million. What explains the opposing trends? Most, but not all, firms that are members of ACRA are heritage-only companies. Additionally, there were some (29%) non-member firms surveyed but these firms likely fit the same heritage-only profile of member firms. So, the data indicate that while the market for cultural services was growing, the amount of work going to heritage-only firms was decreasing. If heritage-only firms were not seeing the increase, who was? Data from the U.S. Bureau of the Census (Census) provides a clue. In 2009 and 2010, ACRA led an effort to request a North American Industry Classification System (NAICS) code for cultural resource compliance services. The request was denied and in public comment the Economic Classification Policy Committee (ECPC) of Census stated that “…ECPC considered the proposal and noted that cultural resource management, or cultural resource consulting services is a product provided by establishments in a variety of industries…Therefore, the ECPC does not recommend a new separate industry for cultural resource consulting. ” In short, Census did not establish a cultural resource industry in North America (U.S., Canada, and Mexico) in part because other industries were adequately providing cultural resource services. These other industries were not specified, but the primary “other” must be the Environmental Consulting Services industry (NAICS Code 541620): essentially the multi-disciplinary firms. Anecdotal data from conversations that I have had with a variety of business owners and CEOs over the last year seem to support this observation. Almost all told me that they believe that market share has been shifting from heritage-only companies to multidisciplinary environmental and engineering companies. 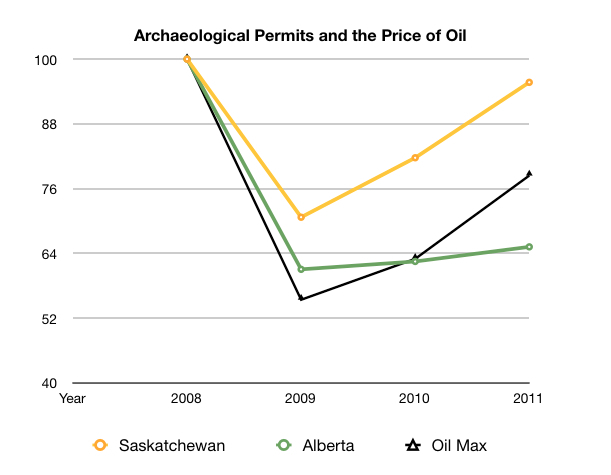 Business and industry data directly pertaining to the heritage industry is difficult to find. To identify and substantiate underlying industry and economic trends, one often has to stitch together disparate data and read between the lines. Such is the case with this analysis. 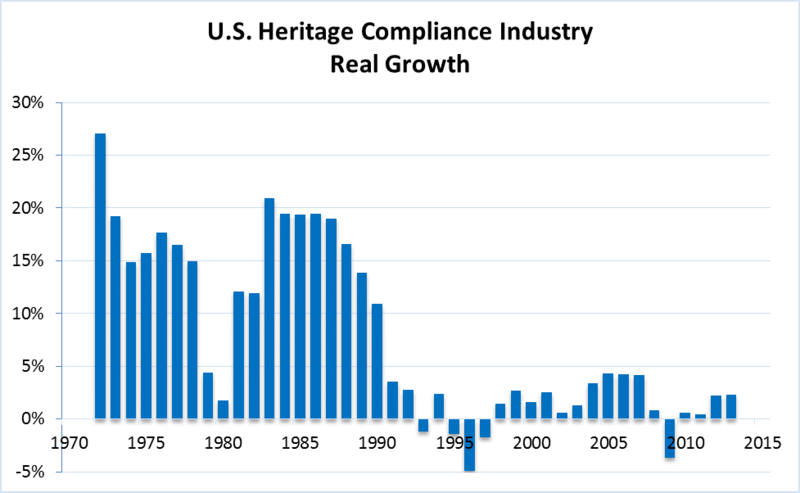 That being said, it appears that while the market for heritage compliance services has been growing faster than the rate of economic growth (as measured by GDP) since the end of the recession, cultural-only firms are not seeing the benefit of this growth. Market share for heritage compliance services is shifting away from heritage-only companies to multi-disciplinary firms.